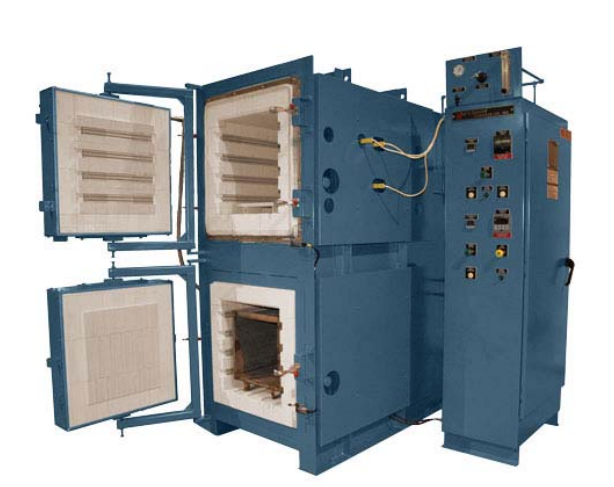 QDA Series: High Uniformity, Dual Chamber Furnace - L&L Special Furnace Co, Inc. The furnace is an L&L model QDA836 with the top chamber used for heat treatments of various steels and alloys up to 2,200°F. The bottom chamber is a tempering chamber that can be used to draw various steels as well as for aluminum thermal processing. The hardening chamber has working dimensions of 16” wide by 15” high by 32” deep. The tempering chamber has working dimensions of 14” wide by 12” high by 32” deep. The oven is equipped with a specially designed control/pyrometry package to allow it to conform to AMS2750E standards for class 2 equipment. Included in this package is a 1” NPT survey port located on the right side of each furnace chamber for uniformity surveys. Two-zone SCR control with digital biasing for temperature gradient adjustment for the hardening chamber is included, along with thermocouple reference ports for both chambers. There is a single- zone SCR for the tempering chamber. The furnace also features ¼” NPT thermocouple ports located in the best possible position representative of each corner of the furnace for both chambers. the oven based on the most recent calibration survey. The tempering furnace is equipped with a ¾” HP air-cooled fan to promote excellent uniformity at low temperatures. The control system features a Honeywell DCP301 dual input program control for the hardening chamber and a UDC2500 single set point control for the tempering chamber. Honeywell UDC1200 overtemperature controls with independent thermocouple and contactors are included for both chambers. There is an optional Honeywell eZtrend chart recorder with six channels. This recorder is wired to a four-position thermocouple jack located on the front of the oven. The first two recorder inputs will be jumped from the control signal of the corresponding temperature control from each chamber. This allows for each of the two remaining channels to be used to record the high and low temperature readings from both the hardening and tempering chamber to be recorded on channels two through six. The control panel is NEMA 12 with fused disconnect. All instruments are calibrated to NIST standards prior to shipment. The thermocouples are lot calibrated and all documentation is supplied. This particular oven is used for titanium heat treatments along with several annealing processes. The multiple program control allows for several recipes to be stored and recalled for each individual process. L&L’s QDA series comes in several sizes up to nominal 24”wide x 24” high x 36” deep, and they are ideal for clients that want more control over their heat treating.